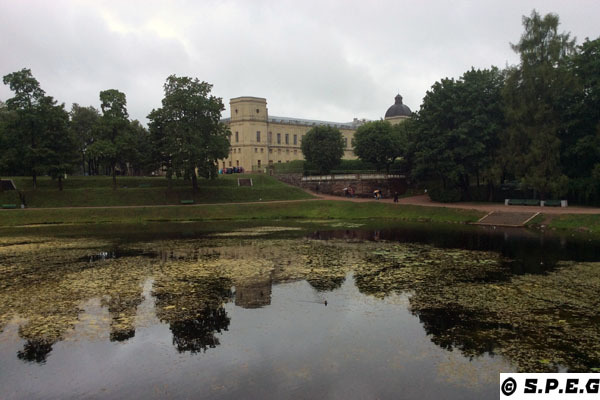 Gatchina is a hidden gem, home to a beautiful historical palace, a nice large park, and mysterious undergrounds. Located in the once war-torn town of Gatchina, southwest of Saint Petersburg, lies one of the most overlooked, yet mysterious palaces in Russian history: The Great Palace. Built in 1766 by Italian architect Antonio Rinaldi, this is the place to explore if you're looking for the road less traveled. Surrounded by picturesque forests and lakes, the estate was once the hunting capital of the Tsar’s and, at over 250 years old, has withstood the test of time by enduring both world wars. Its history includes the notorious coup d'etat against Tsar Peter III by his wife, Catherine the Great and her intimate companion, Count Grigory Orlov, a military officer who was gifted the property by Catherine once she rose to the throne. Following Orlov’s death, Catherine reaquired the estate and gave it to her son, Paul I, the future Tsar of Russia. Paul's passion for the military prompted him to commission Vincenzo Brenna to replace the heavily baroque exterior with a more militaristic facade, which resulted in the regal fortress palace we see today. Since that time, it has been owned by several Tsar’s, the Soviet Union and once annexed by Nazi Germany. Now it stands in quiet repose as a gift to present day Russia. Inside, the Gatchina State Museum offers several rooms dedicated to fascinating art, historical weaponry and antiquities of previous eras. Although some rooms remain under reconstruction from WWII, visitors describe the palace as beautifully opulent and The Marble Dining Room's Carrera columns as particularly stunning. The sweeping landscape of the park is like an untamed wilderness that's breathtaking throughout the seasons. The grounds are well-kept, accessible all year and entrance is free, making it a popular spot for sightseers who champion the park as a great place for walking. From the time of Catherine the Great to the fall of the Provisional Government, the Gatchina Palace has been at the center of many monumental events in Russia’s turbulent history. To learn more click on the links below or scroll the page. The construction of Gatchina Palace was completed in 1781 by Antonio Rinaldi, while the decorative interiors of the Palace were designed by Bazhenov and Voronikhin as well as Vincenzo Brenna who worked in a style that combined high rococo decoration with neoclassical symmetry. Though it is often overshadowed by the more well-known palaces of Saint Petersburg, this great palace stands as a testament to the soul of Russia and its endurance. The Grand Palace is an impressive fortress like building where the family of several generations of Romanovs lived. But when the Bolsheviks took over, the palace was turned into a museum. Then, many pieces of art were moved when Nazi Germany invaded. Gatchina became so badly damaged it was almost beyond repair. Soviet Union turned it into a boarding school then research lab. Restoration began in 1976. Today the Palace has become an important tourist place open to the public all year around. 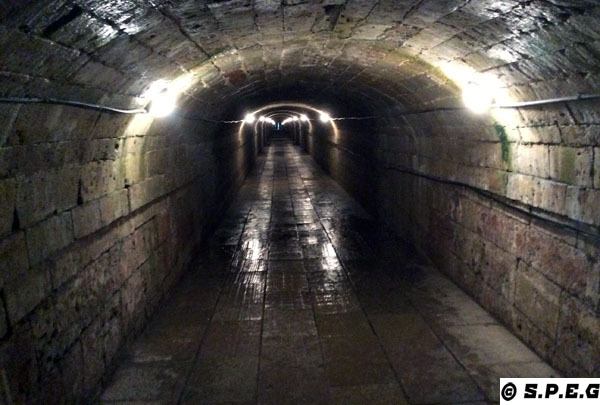 It has 600 different interesting rooms hosting amazing paintings, exhibition of weaponry, scultpures, and much more, but the big attraction is the underground tunnel running from the palace to the ornamental lake. When touring the palace yuo won't have time to see all the rooms, but the ones you should not miss are the State Rooms in the second floor of the central block, which includes the magnificent Chesme Armoury and Grecian Galleries in the semicircular wings. Below I have sum up some of the top rooms to help you get an idea of what to expect when walking inside the palace. Marble Staircase (Opened in 2016, in the Arsenal wing alongside the Rotunda and coat of arms designed by R. Kuzmin. A favorite tourist attraction. Beautiful craftsmanship). Marble Dining Room (Only used for special occasions. Has 16 columns of Carrara marble. Art depicting the life of Dionysus, God of Wine). Throne Room of Paul I (Carved wood lined with red velvet give off a truly extravagant display. Sculptures by G. Neilson. Highly ornate parquet made by layering many types of wood. Designed by Brenna.Its tapestries are the ones woven at the Gobelins Royal Manufactory in France. Gifted by Louis XVI to Paul and Maria in 1782). Crimson Drawing Room (Named after the three tapestries in the room. Bedroom of luxury, shows just how the Tsar’s lived. From the story of Don Quixote. Gifted by Louis XVI to Paul and Maria in 1782). Underground Tunnel Access (Used to lea to Silver Lake. Backdoor is now blocked off. Cold and damp even during summer. Lets visitors feel the mystery and romantic aspects of the medieval times in this palace. 120 meters long). Paul I Rooms (Each of these rulers have implemented their own rooms over their eras). Empress Maria Fyodorovna Throne Room (Each of these rulers have implemented their own rooms over their eras. Contains 59 paintings depicting scenes of nature and bucolic scenes). Alexander III Rooms (Each of these rulers have implemented their own rooms over their eras. Aleksander III spent the first two years of his reign in Gatchina, fearing assassination and a coup). State Bedchamber (Empress Maria’s bedchamber. Almost destroyed during WWII. Very extravagant with artificial marble and gold. Created by Brenna. Shows aspects of high class social life. Restored by Lidiya Strizhenova and Yakov Kazakov. Secret passage in the Grand Bedroom that leads to the emperor’s dressing room). Arsenal Halls/Wing (Added by Nicholas I, son of Paul I and Maria. The Mezzanine Floor. Includes the Bedroom of Paul I and Maria, Maria’s drawing room, dining room, study room of Alexander III, study of the Grand Dukes, study and bedroom of Duchess Ksenia Alexandrovna, and the marble staircase). Greek Gallery (Opened in 2016 to mark the 250th anniversary. Houses the classical art procured by Paul I). Signal Tower (Exhibition at Signal Tower describes why it was named as such). Clock Tower (Gets its name from the clock installed in 18 centuries. Bells strike every 15 minutes of an hour). The Ceremonial Staircase (Leads out from The Vestibule, made of limestone. Paintings depict Gatchina Palac). The Anteroom (Place for visitors to wait for public appearances of the Tsar). Tsar Paul I Private Rooms (Rooms which display furniture and pieces of art owned by Paul I). The park at Gatchina was built at the same time as the Grand Palace, and was designed by Charles Sparrow and John Bush. The park spreads out behind the palace, and is centered on three elongated lakes, the Black Lake, the Silver Lake, and the White Lake. Considered one of the first landscape parks in Russian history, in summer the park is very popular with locals for walks and picnics, while in winter the whole place looks particularly forsaken, but still very beautiful. The nice leafy park is a great place to stretch your legs. If you are going for a stroll you may see the below attractions, which are the top ones. Monument to Emperor Paul I (Sculpted by I. P. Vitaly and approved Tsar Paul 1 himself, the statue which was modeled after Tsar Paul’s ceremonial portrait done by S. S. Shuchukin lies next to the parade ground. It was made with refined Finnish polished granite). Priory Palace (Originally constructed to be a palace for the Knights of the Maltese Order (St. John) by Paul I. It now serves as a museum to its history and can be accessed through the park). White Lake (A favorite fishing spot of the Romanov family). Silver Lake (A favorite fishing spot of the Romanov family. The underground passage leads to here, but the exit has since been blocked off). Karpin Pond (A favorite fishing spot of the Romanov family). The Grand Palace owes much of its mysterious feel to the 120-meter-long underground passage connecting the palace with the charming Echo Grotto, famous for its echo qualities, where you can hear yourself before exiting. The underground passage from the Palace to the Silver Lake was built in Count Orlov's time, although there was no particular need for it. This secret underground passage was built for Paul I, which later he used it for disappearing and reappearing to amaze and amuse his guests. There is a secret door in the former Grand Bedroom on the second floor that offered access through a back staircase to the emperor’s dressing room on the ground floor, and then to the basement, which was connected to the passage. As a matter of fact and as popular legend has it, the ghost of Paul I is still attached to the tunnel. Open: June 15 to August 31: Daily, 10 am to 7 pm. Last admission is at 6 pm. Closed on July 7 and August 4. September 1 to June 14: Daily, 10 am to 6 pm. Last admission is at 5 pm. Closed on Monday and the first Tuesday of each month. You can buy tickets online through their official website, or at the ticket office. Being not crowded as Peterhof and Tsarskoye Selo you can easily buy your tickets upon your arrival on the spot. The Gatchina Imperial Estate is 45Km from the city of Saint Petersburg. To get there you can take the train (cheap but crowded), the bus (cheap but slower), or, much better, take the car (faster and affordable). Trains depart from the Baltysky Railway Station and leave every 1-2 hours. Buses depart from Moskovskaya Metro Station. If you go by bus take the N431, while if you go by Marshrutka look for K-18 or K-18A and K100. K-18A is specifically for Gatchina Palace. Please note that the Marshrutka K-18 drops one off around 200 meters from the entrance, giving tourists a perfect opportunity to experience the park. If you drive yourself you need to take the M20 highway, connecting Saint Petersburg and Pskov, crosses Gatchina from north to south. If you wish to go by car but don't like the idea of driving yourself you can rent a car with a driver, which is higly recommended. 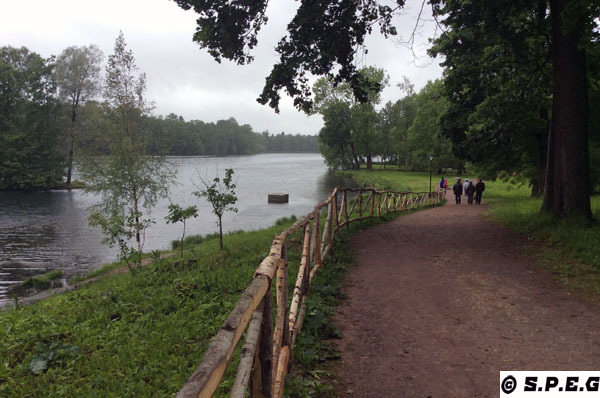 Gatchina is only a few minutes away from Catherine's Palace but not many tourists go there. Is not famous as the Imperial Palaces at Peterhof and Tsarskoe Selo, but its rich history, stunning palace and park make it an interesting place to visit. We'd recommend you spend the whole day exploring this sublime place. You should know that though the Gatchina Palace is advertised to open at 10 am, security will not let you in until 11 am. During the winter months, the park trails can get icy and slushy, making it harder to enjoy the trails. A St Petersburg Card provides free entrance to Gatchina Palace. This includes the Signal Tower as well as the underpass. The average time suggested for visiting the Palace and some areas of the park is 4/5hrs. Don't miss Priority Castle and the church at the top of Gatchina's main pedestrian mall, just near the park. Ticket must be bought separately for the Castle! If you want you can rent a small boat and cruise across the lake inside the park, but only in summer. If you are with kids we have no doubts your kids will love to spend a full or half day in Gatchina as the palace has one of the most beautiful gardens in St. Petersburg. 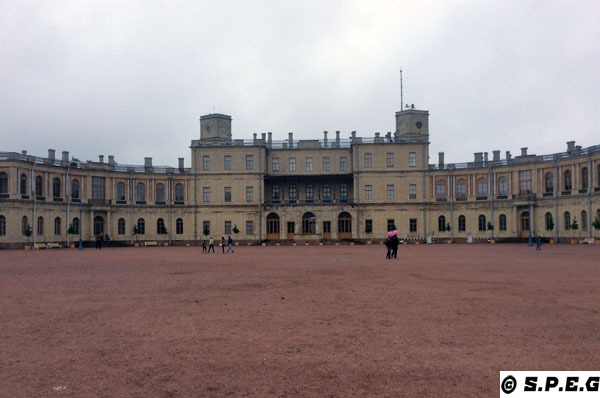 From Gatchina return to St Petersburg Attractions or go to the Homepage.